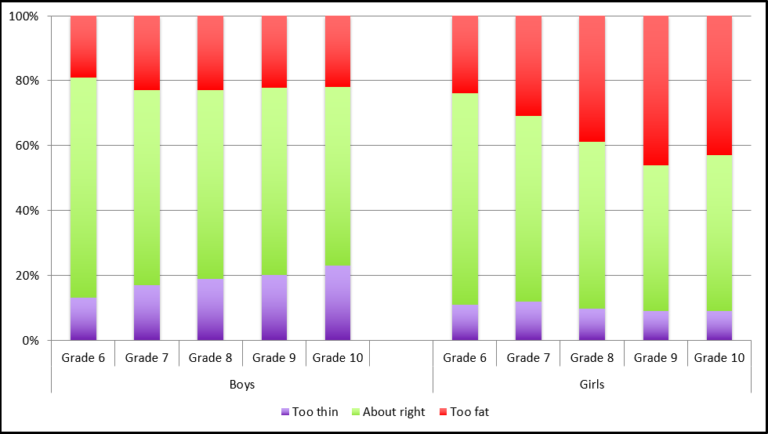 In 2014, the percent of boys in Grade 6 who thought they were too thin increased from 13% in Grade 6 to 23% in Grade 10. The percentage of boys who self-reported their body as too thin was greater than the percentage who were actually thin. Only 4% of boys in Grades 6 and 7 were actually thin as were 2% in Grades 8, 9 and 10. While more boys than girls said they were too thin, more girls than boys said their body was too fat. The percentage of girls who said that their body was too fat was considerably more than the percentage of girls who were actually overweight or obese. The percentage of girls who believed they were too fat increased with advancing grade, from 24% in Grade 6 to 46% in Grade 9 and 43% in Grade 10. Between 15% and 17% of girls in grades 6 through 10 were actually overweight or obese. Please click here to view Poodle Science, an animated video exposing the limitations of current research on weight and health.